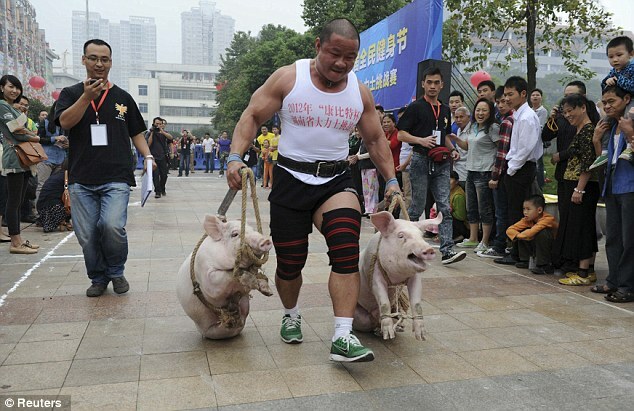 The weight-lifters - pictured during the pig-carrying leg of the competition – were taking part in the Hercules challenge race in Hengyang, in the nation's Hunan province last week. 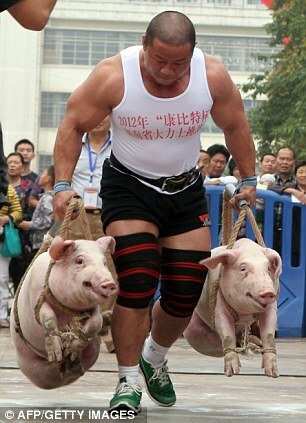 The would-be ironmen had to carry the pigs 32 yards, along with other tasks. 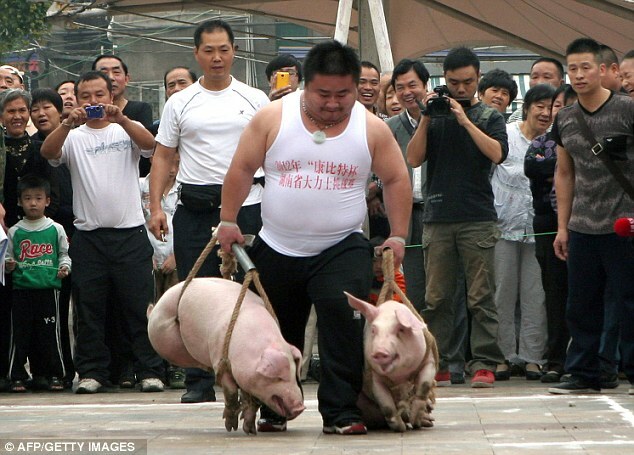 Some of the competitors effortlessly lifted the pigs across the finish line. But others seemed to be making, well, a pig's ear of it. 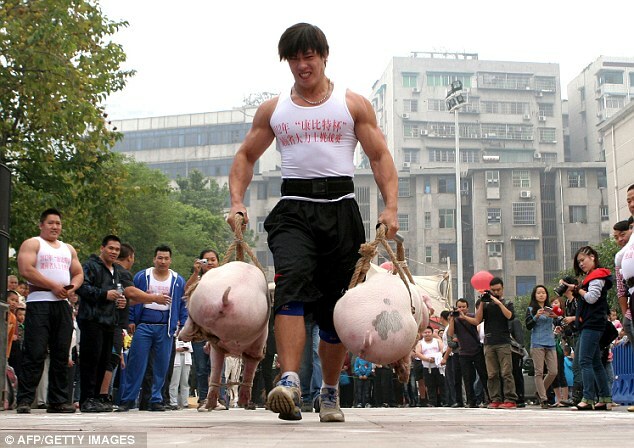 The pig-lugging is just one element of the National Fitness Festival, which was launched in 2009 to promote exercise in the region. It is now in its third year and includes a range of sporting activities. Ten teams, divided into school groups and social groups, took part in this year's event, with 300-plus aerobics enthusiasts ranging in age from four to 60 years. 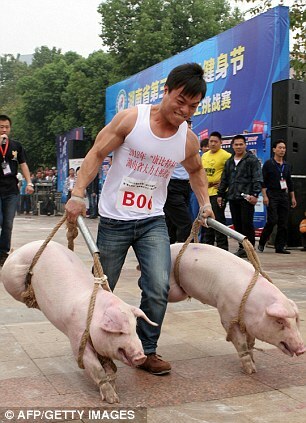 The Hunan province claims that over a third of the area's population regularly take part in sports activities, and the National Fitness Festival has been credited for helping that happen. 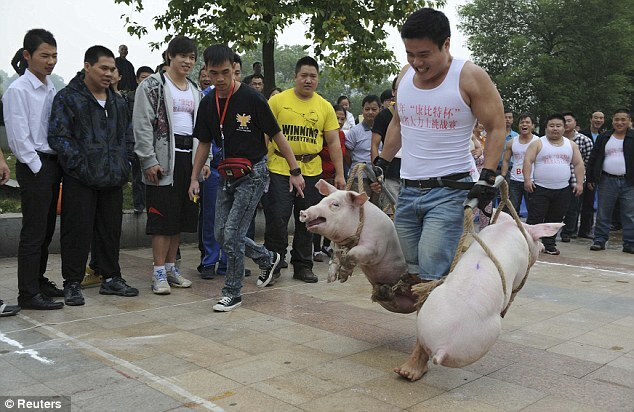 China is the world’s biggest pork market, importing some 800,000 tonnes a year, hence the fondness for getting hogs involved.